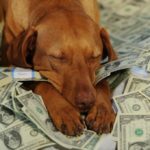 The Friday File: In 2017, Americans spent $72 billion on pets. That is equal to the GDP of the 70th largest nation in the world, edging out Myanmar and Luxembourg. $30 billion went for food, $18 billion for veterinary care, $16 billion for supplies, $2 billion buying the pets, and $6 billion on miscellaneous stuff. The total number of pet-owning households is about 75 million or 60% of all households.